Searching for that special indoor rated LED par can that is totally bright, loaded with features, available in either black or white housing, and as quiet as a church mouse? 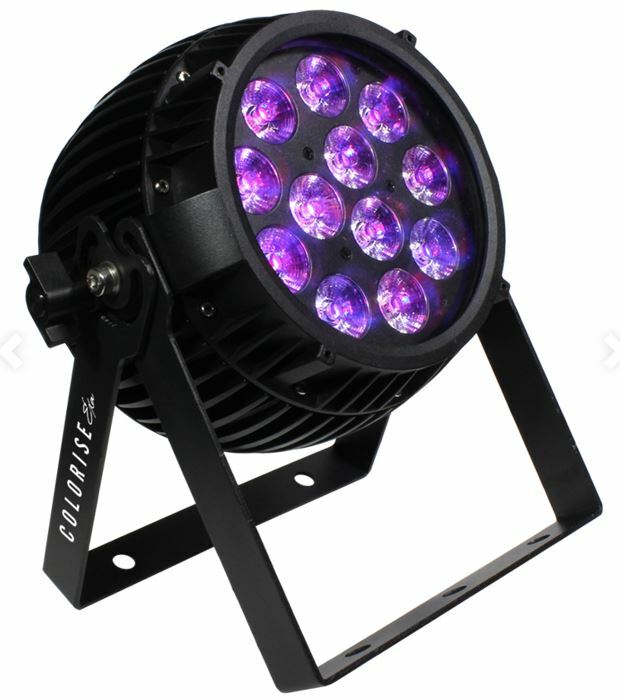 Look no further than Colorise™ LED par cans! Colorise™ EXA fixtures come fitted with 12* 15W high output 6-in-1 RGBAW+UV LEDs with a 25° beam angle, and also feature our new, built-in AnyFi™ wireless DMX receiver, which can flawlessly support both Skywire™ and W-DMX™ 2.4 GHz wireless DMX signal types for ultimate wireless DMX connectivity capability. They also feature highly efficient, natural convection cooling thanks to their attractive cast aluminum housing with heat sink design. There are no internal cooling fans in these fixtures, which mean absolutely zero noise. Colorise™ EXA LED PAR cans are a great choice for any "sound-sensitive" environment. Users can control Colorise™ EXA fixtures in master/slave using either 4/5/6/7/9 or 12-channels of DMX, and it has a well-structured, easy to navigate LED control panel menu with 4 electronically touch sensitive navigation buttons that make programming (and button pushing) a breeze! There are 5 built-in auto programs that can be accessed individually via the control panel, or in DMX mode with a separate speed control channel. Users can also program and store up to 3 of their own 20 scene programs, which can also be accessed in DMX mode. Scenes may consist of custom colors, strobe effects, color fades, or even insert any of its built-in programs with separate speed control settings. Some other remarkable features of Colorise™ EXA fixtures include their many built-in preset colors + white color temperature settings, variable electronic dimmer & strobe, menu key lock, flicker-free constant-current LED driver, color calibration settings, 2 sound active modes (color and white strobe only), and 32-bit dimming curve settings for smoother (and slower) dimming capabilities. Colorise™ EXA fixtures also come equipped with dual mounting brackets, industry standard PowerCON® compatible power input/output connections, 3/5-pin DMX in/out jacks, and are available in either black or white colored housing.